How do you make a child happy? Well most of us know that sometimes all it takes is a few kind words or a small treat. Those of us who are parents will know that we will do almost anything it takes to make our children happy. I am truly blessed because my one and only child is healthy and happy. Not everyone is as lucky as I have been so far. There are many families who have very poorly children. And many of those children are poorly because they have some form of cancer. So I’ll ask the same question again ….. How do you make a child happy ….. when they are poorly? I recently visited the Paediatric Oncology and Teenage Cancer Trust Unit at the RVI along with my two Quilts for Comfort Trustee colleagues. I must admit I was a little apprehensive but I felt it was something that I needed to do. We were given a super tour by Jenny the Matron amongst others. And I must admit I had a rogue tear in my eye thru the whole tour. We were not shown anything gory. We saw plenty of young families in different waiting rooms. And what played on my mind was that all these parents have a poorly child. It’s a super facility. It’s bright and cheerful and the staff are so good with the children. They are well trained and know exactly how to deal with every eventuality. I was really impressed. Thru the whole tour as we moved from one section to the next I thought to myself what can I do for these children to make them feel better? And as if by magic I witnessed something that was truly magic. I hope I’m not boring you to distraction. Please bear with me for a wee bit longer because those of you who have donated quilts, quilt tops and blocks will appreciate what I have to tell you in the rest of this post. During our tour we were invited into a side ward where two little boys were resting. They had recently had some kind of treatment and therefore not feeling very enthusiastic about life in general. One little boy, Boy A, has already received a quilt from Quilts for Comfort which he brings with him every time he visits hospital for treatment. His starry blue quilt was spread over his bed as he lay there watching TV. The other little boy, Boy B, had not received a quilt from Quilts for Comfort yet. In fact his security blankie had been lost in the hospital laundry for which he was quite upset. Boy B really loves dragons/dinosaurs, as little boys do. It just so happens that in our pile of some forty quilts which we were handing over to the unit there was one dragon quilt. I think you can guess what happened next. Our Nicola gifted the dragon quilt to Boy B. From where I was standing, I had the perfect viewpoint of the wee boys’ reaction when he saw the quilt had dragons on it. His face lit up and he was immediately cheered up. I was so pleased to see exactly what happens when a young child or teenager is given a quilt made by the Quilts for Comfort family. It’s magic. And it is witnessing first hand, exactly how the magic works, that will keep me on track making quilts and doing anything I can to help bring comfort to the children who need it. The whole idea of this tour was really daunting for me. I was afraid of intruding on families that were going thru one of the most uncertain times of their lives. However the staff at the cancer unit knew exactly how much to show and how not to intrude in personal lives. We were made to feel very welcome and appreciated for the quilts we supply. And of course the cakes that Nicola baked went down very well indeed. I may be biased but Nicola makes a mean Millionaire Shortbread! So to all the ladies who take time to make quilts, quilt tops and piece blocks, to those who help in any way they can I send a big thank you. I assure you all that every stitch is worth making. So whether you make a whole quilt by yourself or pool together as a group to make a quilt top, let it be known that each and every quilt will bring comfort to someone deserving comfort in a time of need. I found this post rather difficult to write. What I experienced first-hand was very humbling. I shed more than a few tears remembering my experience but I think it’s worth telling you that I saw with my very own eyes the goodness we’re spreading with every quilt donated. Boy B’s dragon quilt was pieced by Lillian. Lillian if you’re reading this, you’ve brought comfort to at least one poorly little boy this week. So ladies keep those quilts coming. 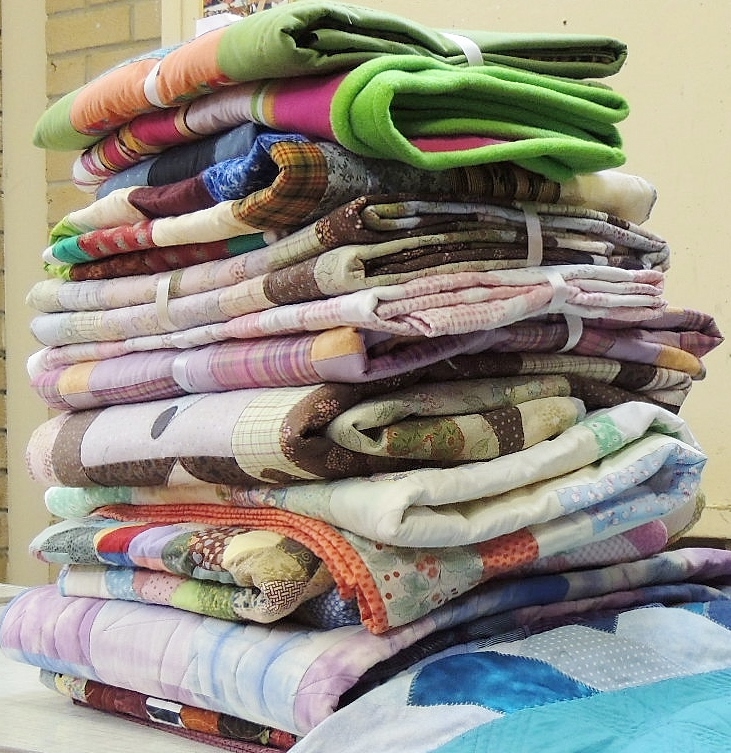 Our next Quilts for Comfort volunteer day for will he held on October 14th. So why not join us on that day. Remember together we can bring that much needed comfort, one stitch at a time ….. Categories: Quilts for Comfort | Tags: Paediatric Oncology and Teenage Cancer Trust Unit at the RVI, quilts for comfort | Permalink.